On the beach: Razor clams. How do you like yours? In the video, you can hear one happy clammer talking about his fresh catch, noting “You can’t get ’em this tasty in the restaurant.” I don’t know where he’s been eating, but I’d have to beg to differ. Some dozen-or-so years ago, Mac and I ate at Lampreia and ordered an appetizer of fresh razor clams, simply pan-seared in butter. Mention the words “razor clams” to us today, and it never fails: One of us will say, “Man, remember those clams Scott made?” — as if either of us could ever forget them. Occasionally since then, when we find fresh razor clams at our local seafood counter, we’ll treat ourselves to some. Even at the “sale” price of $14.99/pound, those are cheaper than buying a clam-gun and a shellfish license and driving to the coast. Though nowhere near as much fun. Then I valiantly try to recreate Scotty Carsberg’s version, dusting the clams in flour and pan-searing them quickly, over high heat, in butter. Lord. As for razor clam chowder, you haven’t lived till you’ve tasted the stuff at the Steelhead Diner, where Kevin Davis recently served me a bowl sweetened with Yakima corn, apple-smoked bacon and a wisp of truffle oil. Those clams were from Alaska and who knows? Maybe they came from the beach where I spotted that moose. 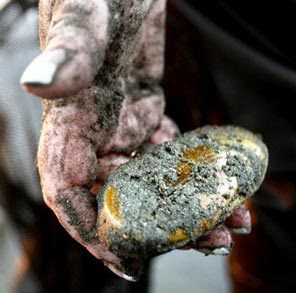 So tell me: Have you ever been razor clamming? What did you get? Where did you get it? How did you cook them? And have you, uh, dug any razor clams in restaurants in or around Seattle?